Move over flowers, chocolate, and jewelry, it’s all about experiences like food and travel this Valentine’s Day, according to research by Mastercard SpendingPulse. Mastercard SpendingPulse research broke down national retail sales data from sales activity within Mastercard payments, cash and checks and found that spending on experiences at hotels and restaurants is poised to see big growth in 2019. Sales during pre-Valentine’s Day week of February 8 through February 14 indicated that retail sales at restaurants this year will jump 5.4% to $15.3 billion from last year. Hotel sales will likely see about 9% growth to $1.4 billion from 2018. Meanwhile, Mastercard’s research found that traditional Valentine’s Day gifts are likely to lose popularity. Following a big surge in 2018, jewelry sales are expected to to fall about $1.1 billion in 2019, and luxury sales are anticipated to dip 0.4% to $250 million. Though the number of people choosing to celebrate Valentine’s Day continues to decline, according the the National Retail Federation and Prosper Insights & Analytics’ annual Valentine’s Day spending survey, the amount of cash people are willing to shell out this year is set to hit a record $20.7 billion. The NRF surveyed about 7,384 adults 18 and older and found that only about 51% of Americans plan to celebrate Valentine’s Day this year. 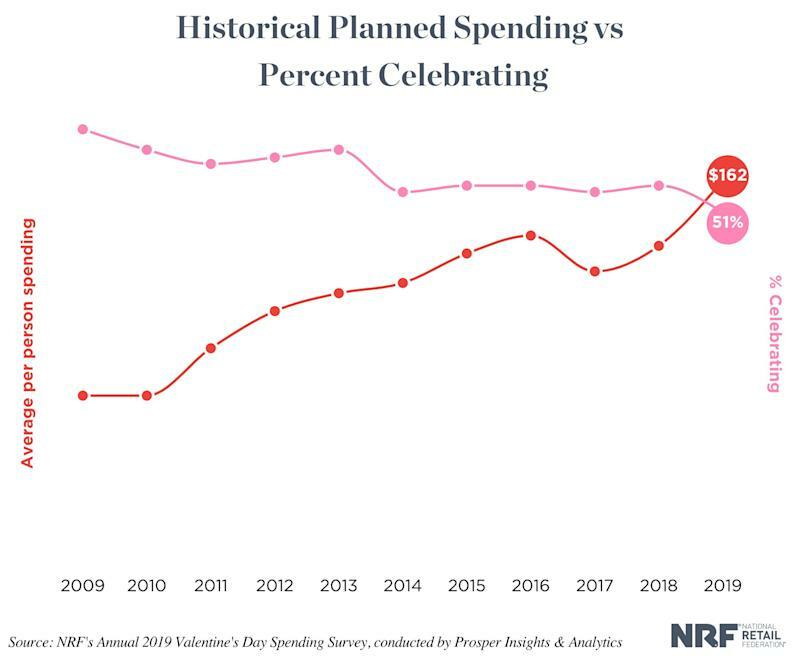 Those looking to participate in Valentine’s Day celebrations will be spending about $161.96, which is an increase of 13% from 2018. The previous Valentine’s Day spending record of $146.84 was set in 2016. “Those who are participating are spending more than ever and that could be the result of the strong economy. With employment and income growing, consumers appear to be expanding the scope of who qualifies for a card or a box of candy,” NRF President and CEO Matthew Shay said. Easter supermarket opening times: When are Tesco, Asda, Sainsbury's and Aldi open on bank holiday?